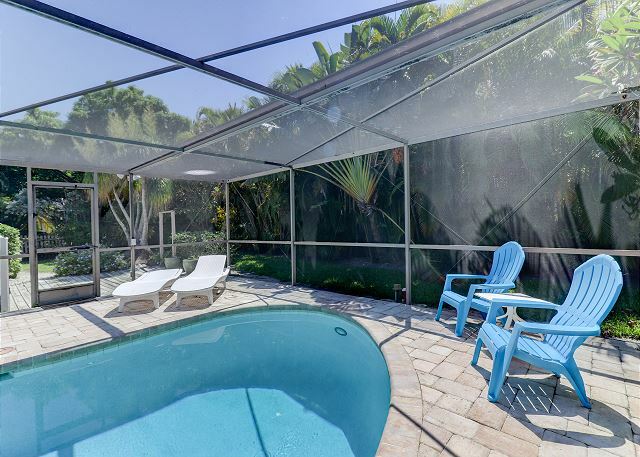 Cottontail Cottage:Private Pool, PetFriendly & Only a Short Hop to the Beach! 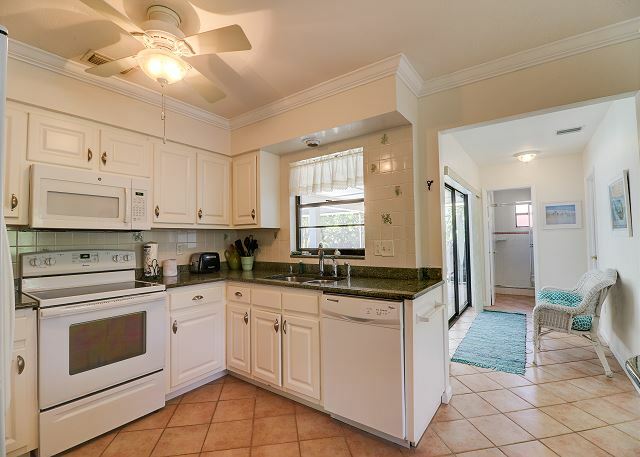 Check out this ground-level, 3 bedroom, 2 bath, pet friendly home that sits only 7 houses back from West Gulf Drive where you'll quickly find the beautiful sandy beaches & the Gulf of Mexico! 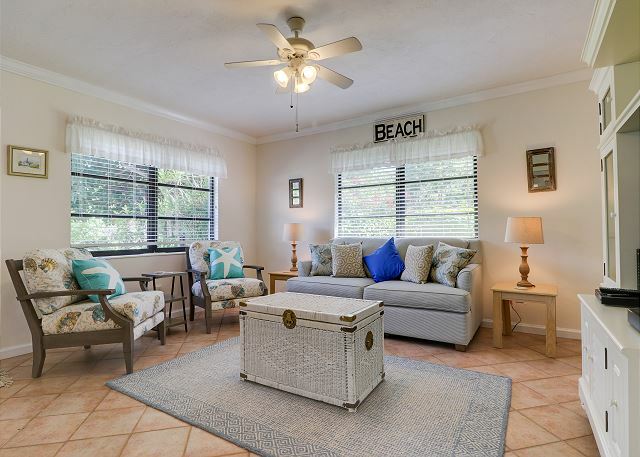 This beachside bungalow has all the island charms you could hope for in your next Sanibel vacation home. 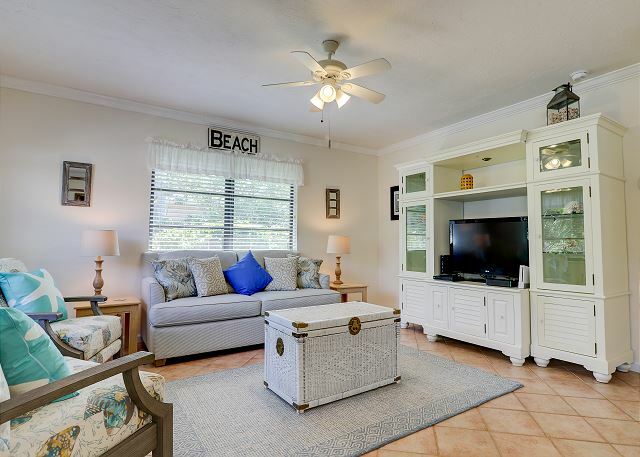 This adorable home features an open floor plan, a large screened in-ground pool, and the near beach convenience in the most desirable neighborhood on the island! 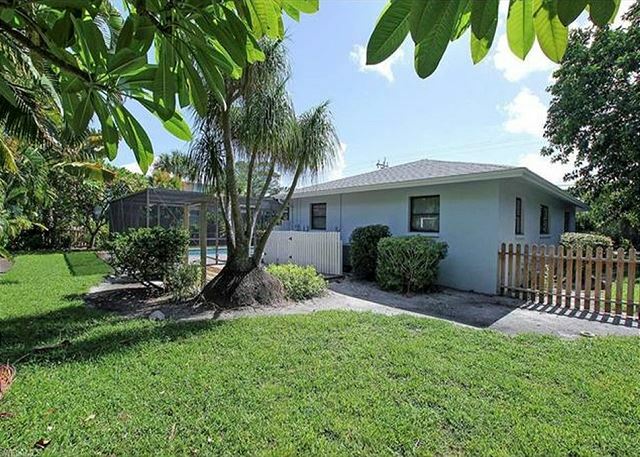 This single-story beauty also boasts a great living, dining & kitchen area great for entertaining family and friends and helping to make those forever memories. 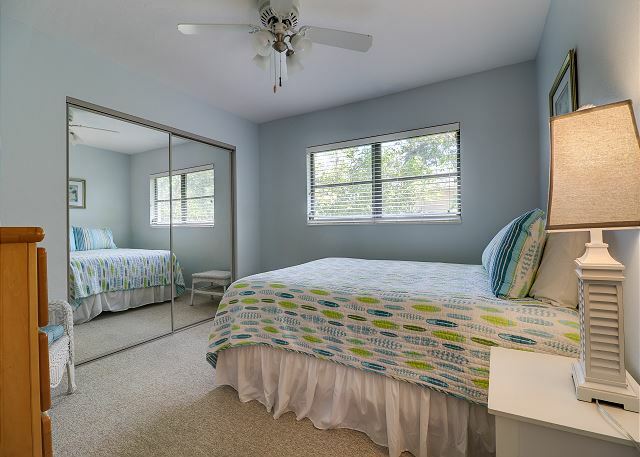 The 3 comfortable bedrooms and the 2 sample-sized bathrooms are sure to please you and your guests (6 max). 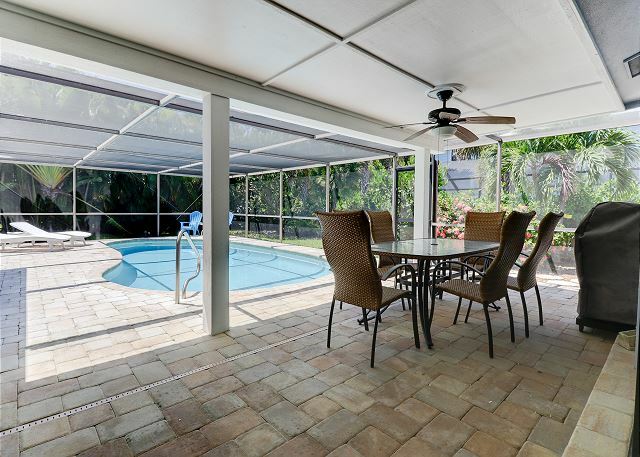 You'll also enjoy your large screened lanai with your private heated pool, the perfect spot for your morning coffee, an afternoon swim, and your evenings dining alfresco. 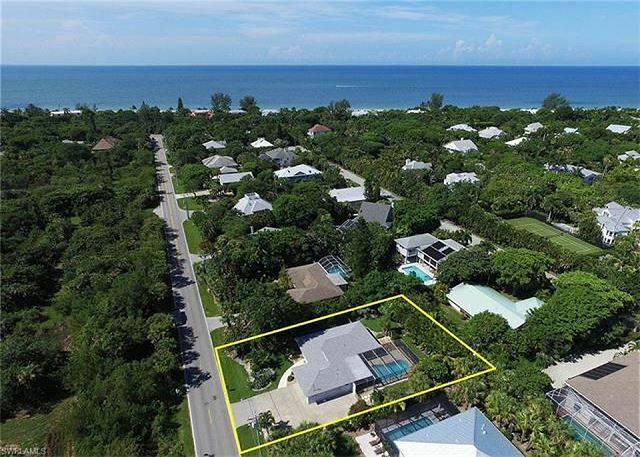 So, pack your bags and come relax on the shell strewn beaches of Sanibel & Captiva and immerse yourself in island living in your new home away from home. 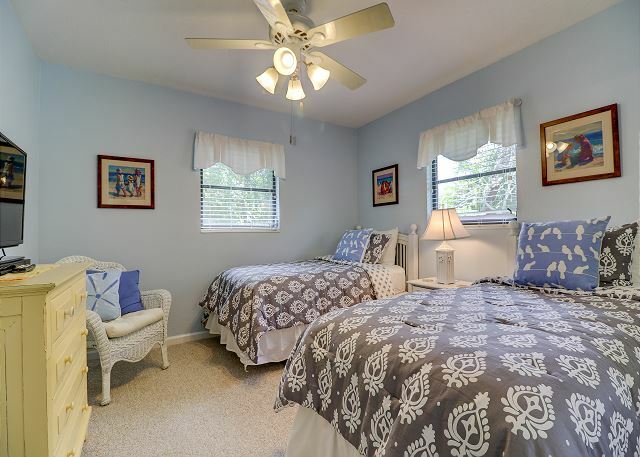 Home amenities include: 3 bedrooms/2 bathrooms -- 1 King bed, 1 Queen bed, and 2 twin beds, (sleeps 6), 3 TV's, free WIFI & cable, large heated pool with a large screened lanai, washer & dryer, fully equipped kitchen, BBQ gas grill. Pets considered (Dogs only). 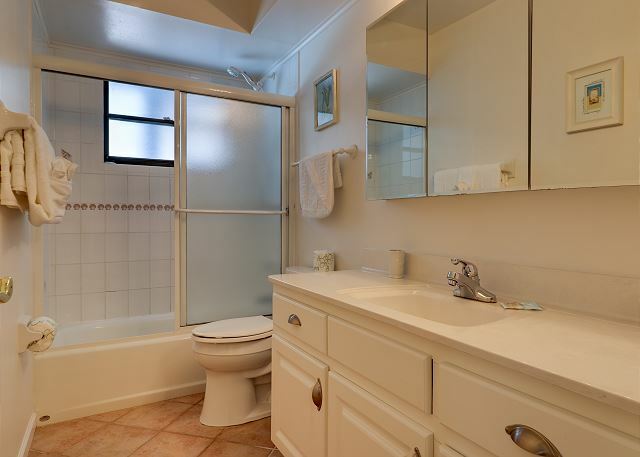 Bed linens and bath towels included. 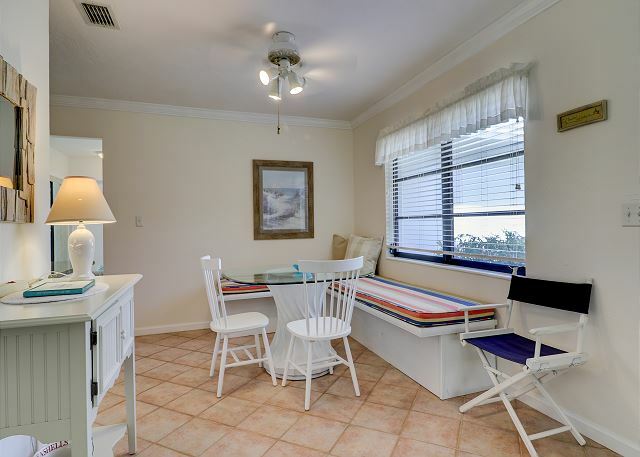 Beach chairs, beach towels, and an umbrella are provided for added convenience. 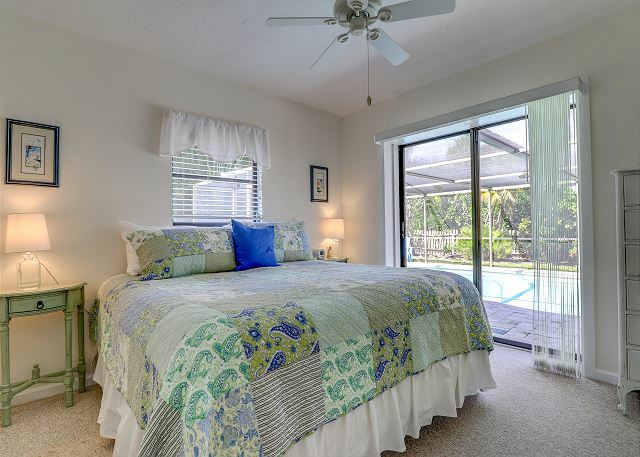 Guest Reviews of cottontail cottage:private pool, petfriendly & only a short hop to the beach! Thank you for leaving this review of Cottontail Cottage! 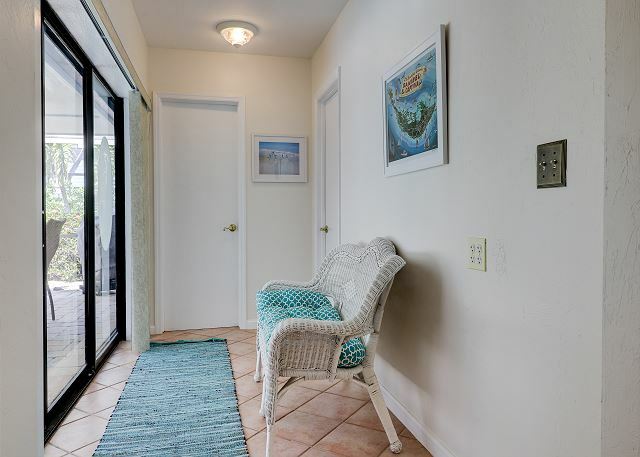 We are so glad you enjoyed your stay on Sanibel! We hope to have you stay with us again in the future! Review by W A V.
Our family of grandparents, daughter and soninlaw and 2 granddaughters—plus their goldendoodle, spent 4 weeks in this lovely location!! The location was perfect for biking or walking to the beach access—grandfather has mobility problems but we were able to park with a handicap sign in any of the beach access areas—this was a perk!! 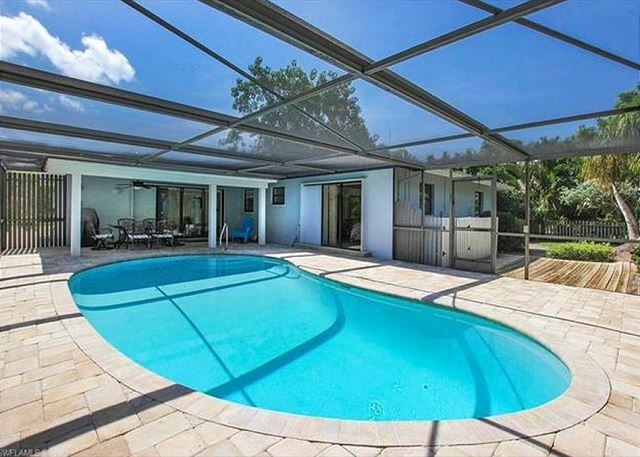 The house and pool is beautifully furnished and had everything we needed. We did , However, call the main office as there is only one set of linens for each bed...this was a bit unusual from our past experience! We were told we could “purchase” another set but did not think this was necessary as we brought some of our own linens—they did bring us another set for the king size bed with no charge! 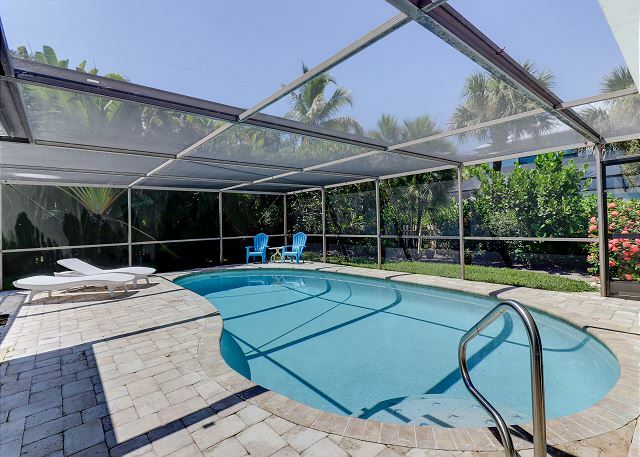 The property is well managed with weekly landscaping and pool service. Thank you for the free beach bag and special soap bar! There is a Goodwill close by so we picked up some bargains that we left(like an extra lamp!) the welcome booklet could include more information, like brochures for restaurants, days the outside services come , phone numbers we might need, etc. overall, despite the Red Tide the last week, we had a wonderful stay!! Thank you for your hospitality!! Thank you so much for your review! We are so glad you enjoyed your stay with us! Please let us know the next time you are planning a trip to Sanibel! We are happy to help with your next vacation! This is our third stay at this location. Obviously we enjoy the house very much, our main concern is the VERY old and uncomfortable furniture in the main part of the house. We had to bring in the patio chairs to have a half way comfortable seat. Would be GREAT to have new living room seating. Thank you so much for leaving your feedback. We will definitely pass this information along to the owner. We are so glad you enjoyed your stay and we hope to see you again! Our stay at Cottontail Cottage has been fabulous. 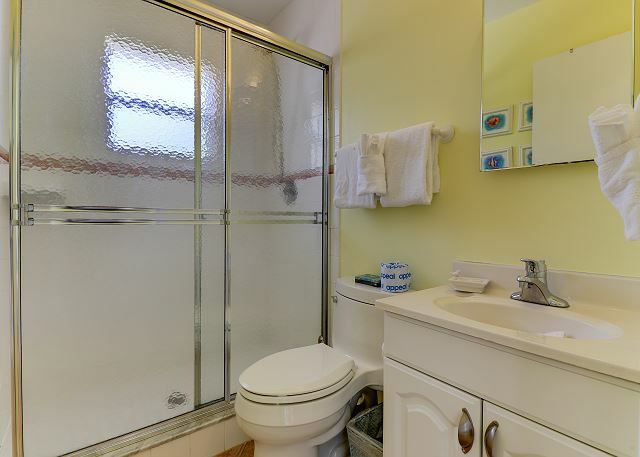 The house is exactly as it was described in the listing, actually even better. There are too many extras to even mention. Everything you need is here and of very high quality and the owner has decorated so well to make you feel like you are in a tropical paradise. 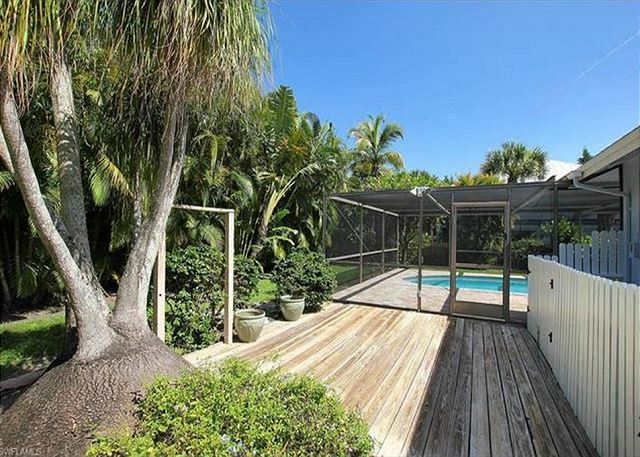 The house, pool and yard landscaping are beautiful. 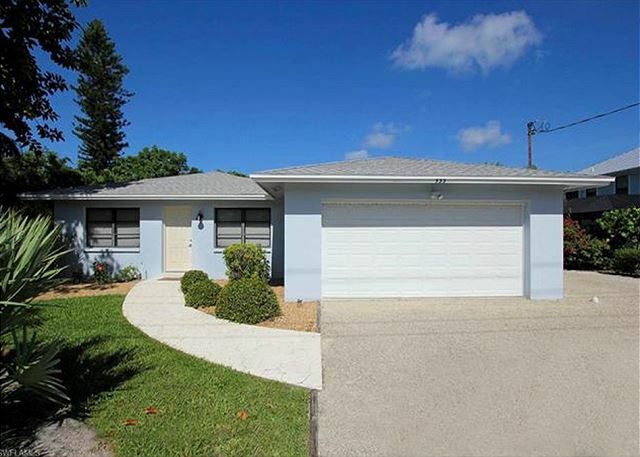 And it is in a very quiet neighborhood of quality homes close to the beach, shopping and many attractions. 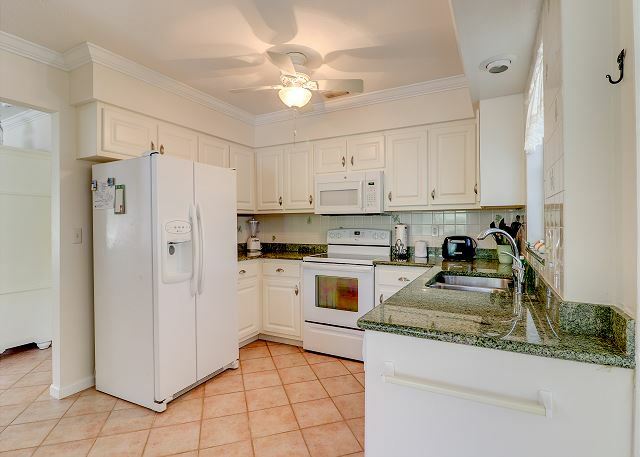 And being able to have our pet here was an important factor in our choosing this home. We feel like we are not just in a house but in a home. This is so much better than staying in a crowded and noisy resort or hotel. 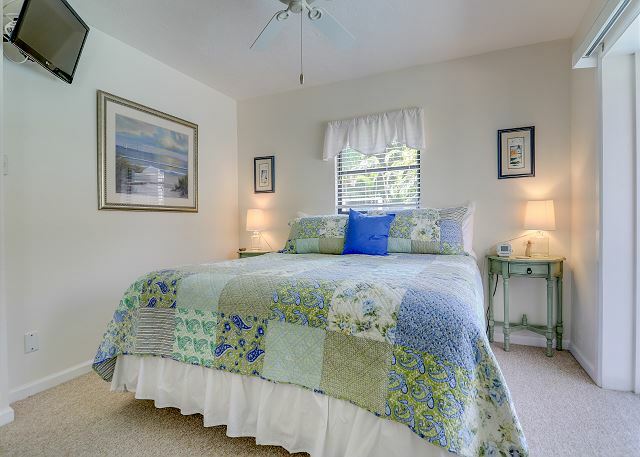 This is THE place to stay in Sanibel! We are so glad your stay was wonderful. It was great having your family here. We look forward again to making this your home away from home.